This guide will show you how to fix a burn in leather. 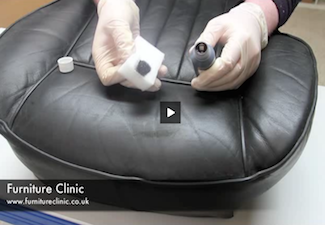 Sometimes burns penetrate the leather all of the way through, and so this guide can also be used to demonstrate how to repair a hole in leather as well. 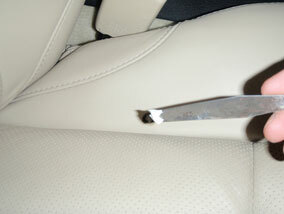 This photo shows a cigarette burn in a leather car seat. To fix the burn you will need the following products. 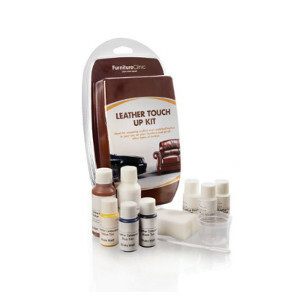 Leather Touch Up Kit - to restore the color. 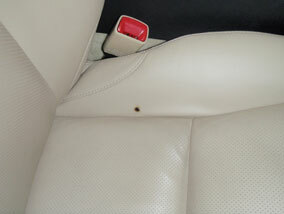 A burn causes the leather to shrink inwards creating a wrinkled effect and turning the leather hard. The first step is to partially cut the burn out. Cut a cross into the burn about half the depth of the leather and then proceed to cut the burn out cutting around the edge with a scalpel. Again, only about 50% depth into the leather. This method of cutting can be used on burns that have not completely penetrated the leather, for those that have, cut the burn completely out of the leather. This will leave a hole that can then be repaired. 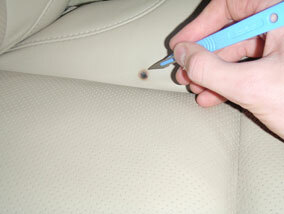 Go to step 4 if your burn didnt go all of the way through the leather and you didn't have to make a hole. Using the tweezers insert the canvas cloth flat behind the leather, ensuring at least a 1cm overlap surrounding all edges of the hole. Then apply the glue, as demonstrated in step 3. 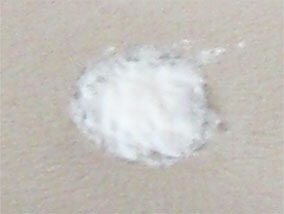 The glue is applied with a thin object like the scalpel or paint stirrer. Push one side of the hole down to raise the other side, then wipe the glue onto underside edges of the hole and stick down. Repeat this so glue is applied around all edges, ensure that there is sufficient glue applied to firmly stick the patch to the underside of the hole. Wait 20 minutes for the glue to set. Now that we have a strong backing in place for the repair, we can apply some heavy filler into the hole to start to fill it. If you are filling a hole, you need to apply about 4 thin layers of heavy filler, drying each layer off with a hair drier and pressing it down as you do so. This avoids shrinkage. If you have only slightly cut a burn out, then apply two thin layers of filler. Apply a small amount of filler into the hole with the palette knife and then wipe the excess from the side of the hole. Dry thoroughly with a hair drier for 3 minutes and then leave it for a further 3 minutes. Gently press the filler down with your finger and re-peat the process until the filler is just below the surface of the leather. Once you are ready to apply your last layer of filler, wipe it over the hole so that the filler stays level with the leather. This step is not 100% crucial as it involves embossing a textured grain pattern into the filler. This isn't necessary to do for most repairs, but we recommend it if you want a perfect finish or are using it as a professional. Alternatively, you could use our Grain Repair product to replace the grain by hand. 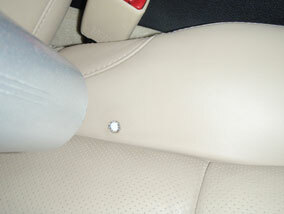 With the heavy filler level with the leather surface, place the grain pad onto the filler and press it down gently. Remove the grain pad after pressing it down and then dry the filler off with a hair drier. 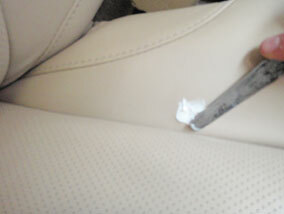 Leave to set for 5 minutes and then gently sand the leathers surface to make smooth. 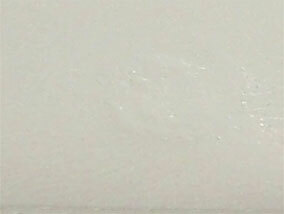 This photo shows a close up of the damaged area with the texture applied to the filler. 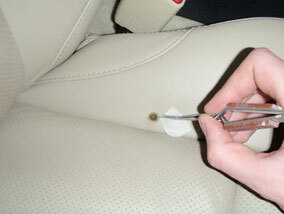 Using the Leather Touch Up Kit, match the color of the leather or, send a piece of leather to us for color matching. Also check our database to see if we have already matched your color before -Color Charts. Apply the color to the filler with a cotton wool bud and dry with a hair drier, leave for 1 minute and apply more color until it blends in perfectly. 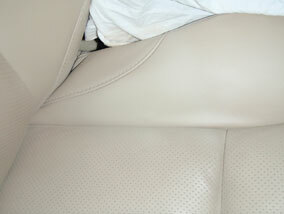 This photo shows the finished seat. The color coat is applied by just applying the color to the filler until it becomes totally opaque. Then, sponge some color onto the filler and further around it to blend it in with the leather. Then sponge the finish onto the area to match the sheen. This is an enhanced image of the above photo. We have zoomed into the area where we repaired the burn to show you how getting the correct grain pattern and color, can make for an invisible repair. Thank you for your message. We would be happy to help you with your leather restoration needs but we require some additional information so we may properly advise you. 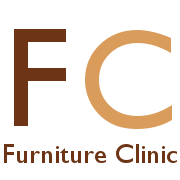 Would it be possible to send us a couple photos to our email address help@furnitureclinic.com so we may further assist you.